Deliver all the above to me and once everything is checked it can be taken to West Paterson where it can be signed by the Secondary League Registrar. Once that is completed you’ll return it here where I’ll then submit it to our district commissioner. Any teams wishing to add players or coaches must first seek approval from the Director of Travel. All requests need to come from the head coach only. Once approved, they will need to register, and upon payment they will then be permitted to be carded to the team. 3. KID Safe Disclosure Form. 2. THREE (3) copies of your new roster once it is frozen with new personnel. Once this is completed take all your paperwork and leave it on my porch in the "IN Box". Email me letting me know that it’s ready for review. If approved, it will be taken to the District Commissioner to be validated. The whole process may take up to a week and you will receive an email when the player pass and new roster is ready for pickup. Feel free to contact me should you have any questions or concerns. GOTSoccer has changed player pass birth dates to month and year and left out the day of the week. Player pass birth dates will be month in text and year only, examples December 2001, July 2004 etc. Rosters will remain as in past years, examples 12/01/2001, 07/01/2004 etc. GOTSoccer has either removed or changed up the system a little that a player must have the state they are affiliated checked from the drop down. If not the player in the state column will have N/A. Having the N/A will cause the birth date to stay with the old player pass sequence of all digits, example 12/01/2001. Simple fix is as a player, team or club go into the player list and chose NJ from the drop down box and the birth date will immediately update to text for the month sequence. PASSES THAT DO NOT HAVE THE MONTH IN TEXT FORMAT CAN NOT BE STAMPED. Hello Coaches, my name is Dawn Donohue, I am contacting you as the new Hanover Soccer League Registrar/Primary Carding Contact. Below are the new carding instructions with due dates and other key items. I will put together a packet for each team with the cardstock to be used for the player passes. Each packet will be labeled with age group team name and Coach’s name. Please note that League registration is now open and the teams have been registered . I will have packets with the card stock available this evening (Wednesday 8/7) after 6 pm. The final date for paperwork to be in the hands of the club’s League Registrar for the start of the season is at least 14 days in advance of season kick off, for example if the season begins on September 8th the deadline is August 24th. Since LR’s & DCs operate on a strict first come, first served basis, it is highly recommended that paperwork be in their hands well before that date. All paperwork for Labor Day tournaments must be in the hands of the DC by August 19th. Card the team early and add players later. It is strongly recommended that coaches immediately schedule a player-parent signing event and determine who will be attending. This should be scheduled no later than August 14th. Only those players who will attend that meeting should be placed on the GotSoccer roster submitted to the DC. Other players can be added later. Do not wait until players return from out of the country/state because they are the best player. Carding will continue to be done via GotSoccer. Please remember that GotSoccer is a carding program. It is not a registration program. Clubs will be informed when the system is up and ready for the new season. This year three (3) copies of the roster need to be given to the DC for validation. One for the team and one for the DC/state office. Add forms will no longer be used when adding players to a roster after the original is signed. Passes may never be handwritten. When a change is made to a roster, the old roster will be brought to the DC who will destroy it and a new roster will be validated. Volunteer coaches will have only one pass. Coaches must take their pass from each game they are coaching to the next game. You will need to provide a copy front and back of the valid pass for each additional team when carding to another team. DCs cannot correct errors on rosters by initialing the corrections. If a mistake is made on a roster, a new one will have to be printed. Once a roster has been printed from the GotSoccer website, then be delivered with the packets to the LR. LR’s & DC’s do not care who physically delivers and picks up the paperwork. However, no one should ever ring the doorbell, honk the horn, knock on the door, or ask the DC’s family to let the DC or the LR know that something is being dropped off or for any other reason unless the DC or LR specifically instructs you to do so. There is an in box and an out box on the front porch. Packets should be put into the in box when dropping off. When they are ready for pick up, you will be notified and they packets will then be placed in the out box on the front porch. Whoever drops off paperwork should place it in an envelope in the location the DC or the LR has designated or conveyed to them. Email the DC that the paperwork has been dropped off. The DC or LR will email the PCC when the paperwork can be picked up. The email address of the contact person must be printed on envelopes used to drop off paperwork. All submitted paperwork must be sorted and separated by type. All player passes in one group; all the medical release forms in one group; all the membership forms in one group; all SAGE forms in one group etc. Each set of papers must be in the same order that the players are listed in on the team roster. There are no exceptions to this. The birthday on the birth certificate must be highlighted with a yellow highlighter. If there has been no change in any of the information on the medical release form, you may use a prior year’s form. Medical forms do not have to be notarized this year. All SAGE forms must be signed by the coach after the SAGE program is explained to the players and parents. Online Training for Concussion website: www.cdc.gov/concussion/HeadsUp/online_training.html. There have been no changes in the forms on the state website since last year, but do not use older forms. If needed, download the latest forms from the NJYS website at http://www.njyouthsoccer.com. Packets and paperwork not properly submitted, even if there are no other errors, will not be processed. Starting Fall 2012: Player passes will no longer require a player’s or coach’s signature. The player must always be listed by the exact name on his/her birth certificate. You do not need to include the player’s middle name. Chris is acceptable for Christopher as it is a shortened form of the name but Jackie is not acceptable for Jacqueline as the letters are changed. Initials are never allowed. Nicknames cannot be used. If a player goes by his/her middle name, the paperwork must nevertheless use their first name. Players who refuse to abide by these rules will not be carded. Paste the photo in the upper left corner on the back of the pass. DCs will not glue photos to passes. You may also choose to upload digital photos to be printed on the passes from Got Soccer. You cannot use Polaroids or photos from old player passes. Digital photos are allowed as long as they are printed on premium photo stock paper. No other paper is allowed. DCs and the LR do not correct carding paperwork mistakes, errors or omissions. They will email the PCC to pick up the paperwork so the team can correct the mistake. Please check your paperwork in detail before it is dropped off. This is also true for ads/drops to the roster, including secondary paperwork, later in the season. All too often, PCCs think their teams have learned to do this simple paperwork yet it winds up with the DC or the LR in need of correction. Please do not waste everyone’s time with incorrect and incomplete paperwork. It is the responsibility of every team to check that the DC has dated, signed and stamped the passes before they are laminated. DC’s sometimes miss invalid passes or paperwork. This does not relieve the Club from any errors. The paperwork must meet the State Guidelines and is the team’s responsibility. Corner Flags this season for Allegro FS, SS & Salem will be at Fil's house. You should only need one set of flags at Allegro given that games are normally never played on both fields simultaneously. If they are not in the driveway they will be directly behind the garages. When returning flags do not leave them directly on the garage door. Place them on the wall between the garage doors. If you’re the first team to play at one of our home fields it is your responsibility to pick up the flags and bring them to the field. It is then the responsibility of the last team on that field to return the flags to their proper location . Use the calendar on right hand side and scroll down to the date and there you’ll find all games scheduled per field. Also, you may use the field menu under the Club option and click on the icon to the right of the field you’re playing on. Should you need to reference this procedure I will post it in the Coach’s Corner of our website without our address information. Have a great season and thanks for all your help. 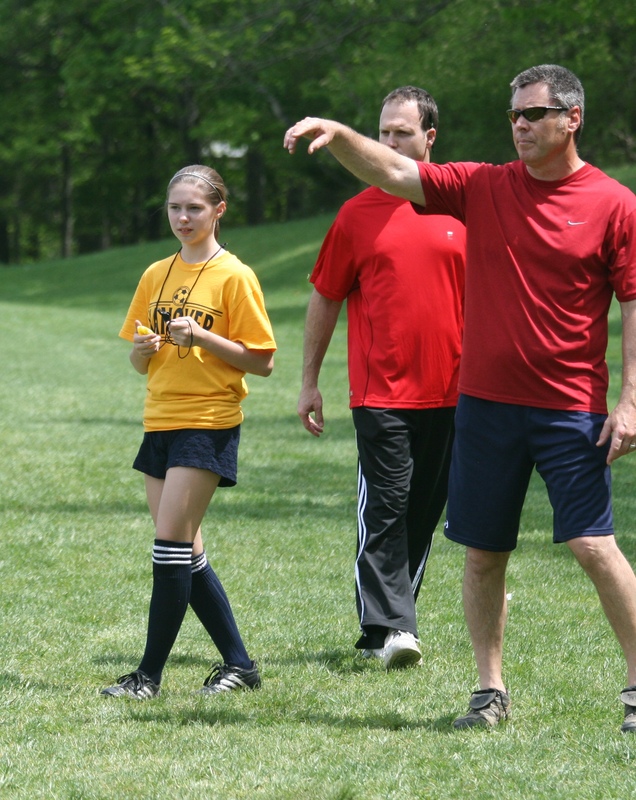 All Coaches and assistants are required to have a Rutgers Safety card & a background check to coach youth soccer. To obtain a background check you must go to the Hanover Recreation Center and pick up the Kanka Foundation form from Denise Brennan, Superintendent of Recreation and Parks Administration between the hours 8:30-4:30 M-F, but please call first to make sure she is available, 973-428-2463. She will explain the process for making the appointment and form processing at pick up. You will be allowed to coach as long as you have scheduled your appointment. Coaches, here is the link to where the F-License courses are being offered. Pay close attention to when registration opens these courses fill up quickly. Please do not rely on the Hanover Township activity line for determining soccer field closures on the weekends. The Hanover Soccer Club exclusively determines our fields openings and closures. On the right hand side of the front page of our website you will find a listing of our fields. There are three categories OPEN, CLOSED, or CHECK/TBD. We try to have field status posted on the front page by 3:00 pm daily and 8:00 am on weekends. As always coaches discretion applies as to whether or not a field is safe for play or practice. In the event we need to close a field all Coaches, players & referees scheduled for that facility will receive an email indicating the closure no less than one hour prior to the event. This applies to all games. Only if your practices are listed on our Master Schedule will you receive such notices. All Coaches and assistants are required to take the concussion course. The link below will take you to the CDC Heads up online concussion course. Once completed print out the certificate and include it your paperwork for your coach's pass.